Earlier, I posted about Scientific Data, but unfortunately the site does not host any of the data. Enter Dryad, data hosting is exactly what the site does. The site hosts opendata and any other digital artifacts associated with a research project. Plus the site provides a DOI (Digital Object Identifier) for citing the the artifacts in research papers. Nature.com is starting a new publication titled, Scientific Data. The goal is to help researchers publish and discover data. The publication content is called a Data Descriptor. It describes the data, explains the data collection methods, lists the columns, and states other essential information about the dataset. Unfortunately, the site does not host any of the data. I think it will be interesting to watch how a site like this develops. The publication is currently accepting submissions. Are you involved with a business that uses open government data? If so, please register to become a part of Open Data 500 to make the list of 500 companies benefiting from open government data. The Open Data 500 list is being compiled by The Governance Lab at New York University. The goal of the list is to identify how government data is being used in business and if the data can be used for innovation. So if you are involved or know a business using open government data, please register them for Open Data 500. Beyond Alphabet Soup: 5 Guidelines For Data Sharing is an excellent post by Markets for Good and Palantir Technologies. Below are the 5 Guidelines. 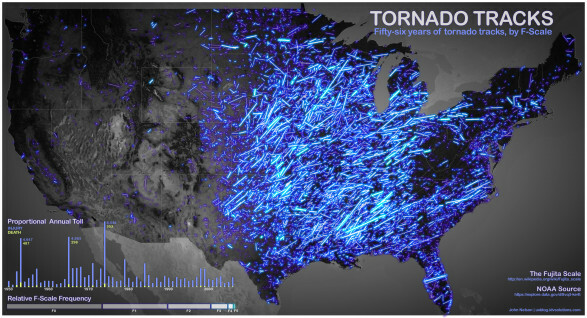 Here is a data visualization of the paths of tornadoes in the US over the past 56 years. The brighter the blue, the more intense the tornado. This is also an excellent example of using opendata. The raw data is available at data.gov. Please continue to pray for the people in Moore, Oklahoma. If you feel moved to help, The Red Cross and Convoy of Hope are two organizations working in the area. If you are looking for public data, Enigma.io is a new startup just for you. Enigma searches, finds, and connects a variety of formats of public data. The data is then linked and made accessible. Watch the video below for more details. Launching in the autumn of 2013, Open Data Festival will be hosting a global data festival. The details are quite vague at this point, but they are looking for volunteers, cities, and speakers. Feel free to sign up. The festival is being organized by the same team that organizes Big Data Week.